Most of the stamps featured in this blog are mint (unused) so this time I've decided to do something different. Everything on this page except some of the errors are used stamps. So we can still enjoy the designs on the stamp themselves I have purposely selected examples with lighter cancels. 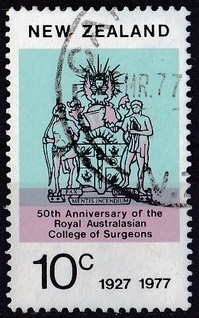 In 1977 the annual Anniversary Issue featured 5 stamps. 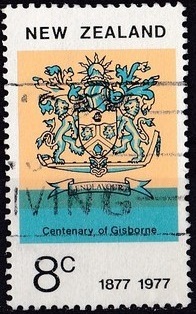 In this case the coat of arms of each organisation took centre place in the designs. In the case of the AA (10c value) I'm not sure that could be called a coat of arms as it is rather more like an emblem. The 3 x 8c stamps were printed se tenant on one sheet while the 2 x 10c stamps were printed together on a second sheet. This gave us the two strips as seen above and on the First Day Cover further down. I've selected 3 examples of each value laid out above a single caption. My purpose here was nothing more than to add variety to this post since I had plenty of used examples to choose from. 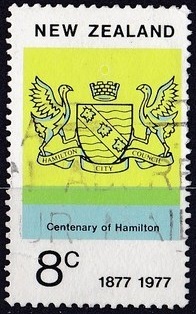 8c - Centenary of Hamilton. 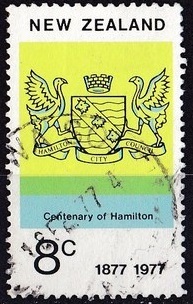 Hamilton (Māori: Kirikiriroa) is the seat and most populous city of the Waikato region, in the North Island of New Zealand. Hamilton is situated on the Waikato plains on the banks of the Waikato River, 80 miles from its mouth. The city, surrounded by hills, lies in a basin comprising rolling land and low hills. 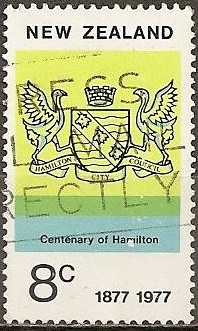 Initially an agricultural service centre, Hamilton now has a growing and diverse economy and is the third fastest growing urban area in New Zealand (behind Pukekohe and Auckland). Education and research and development play an important part in Hamilton's economy, as the city is home to approximately 40,000 tertiary students and 1,000 PhD-qualified scientists. 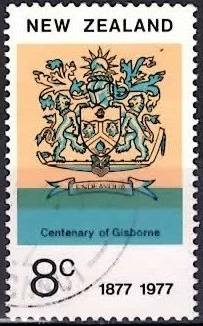 8c - Centenary of Gisborne. 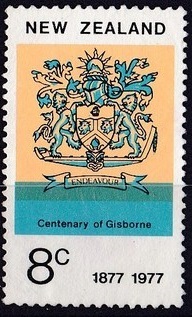 Gisborne is situated on the shores of the northern end of Poverty Bay where the Taruheru and Waimata Rivers join to form the Turanganui River. The city is the largest in the region having a population of 35,700 (June 2015 estimate). It was once a busy port but now is mainly home to smaller fishing boats and pleasure craft. Logs are still exported from the port and coastal ships regularly come and go, taking the region's produce. Now the railway no longer is used due to major track damage the city has become steadily more isolated from the rest of New Zealand. 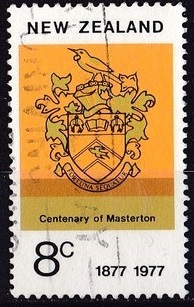 8c - Centenary of Masterton. 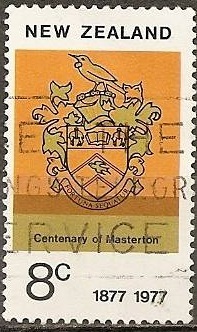 Masterton (Māori: Whakaoriori) is a large town and local government district in the Wellington Region of New Zealand. It is the largest town in the Wairarapa, a region separated from Wellington by the Rimutaka ranges. It is 100 kilometres north-east of Wellington, 39.4 kilometres south of Eketahuna, on the Ruamahanga River. 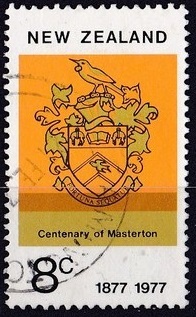 Masterton has an urban population of 21,000, and district population of 24,400 (June 2015 estimates). Masterton businesses include services for surrounding farmers. Three new industrial parks are being developed in Waingawa, Solway and Upper Plain. The town is the headquarters of the annual Golden Shears sheep-shearing competition. 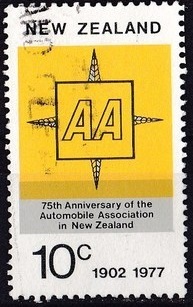 10c - 75th Anniversary of AA. 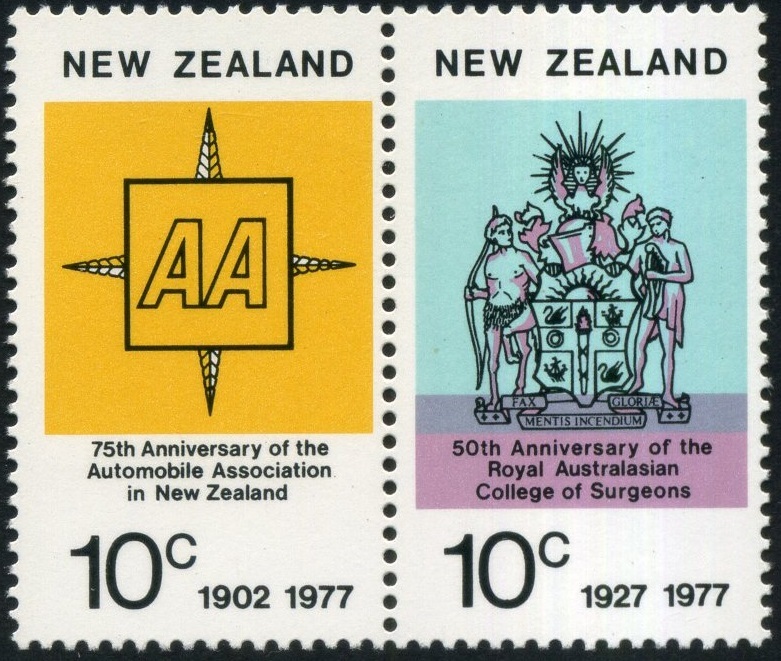 The New Zealand Automobile Association Inc celebrated its 75th Anniversary in 1977. 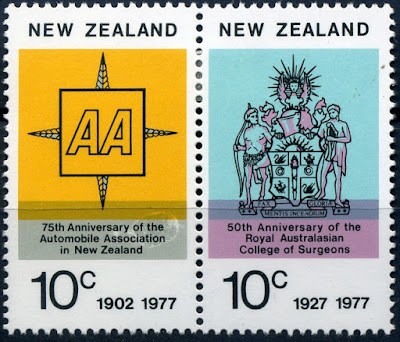 The New Zealand Automobile Association (NZAA or AA) is an incorporated society that provides a range of services to its members including free motoring advice, breakdown services, vehicle repairs, driver licensing, driver training, travel maps, accommodation guides and bookings, insurance and finance. 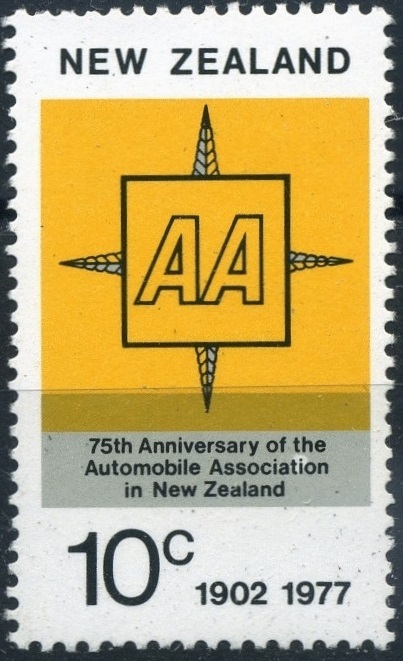 The total membership of the Association was over 600,000 when this stamp was issued. Today (2016) the AA has more than 1.4 million members. Its interesting to note NZAA is also the ICAO code for Auckland Airport. 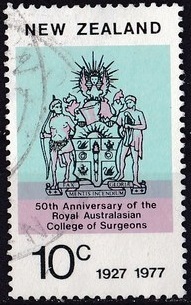 10c - 50th Anniversary Surgeons. 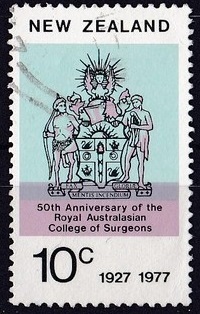 The Royal Australasian College of Surgeons celebrated its 50th Anniversary in 1977. The College in Melbourne, is responsible for training nearly all the surgeons and anesthetists in Australia and New Zealand. 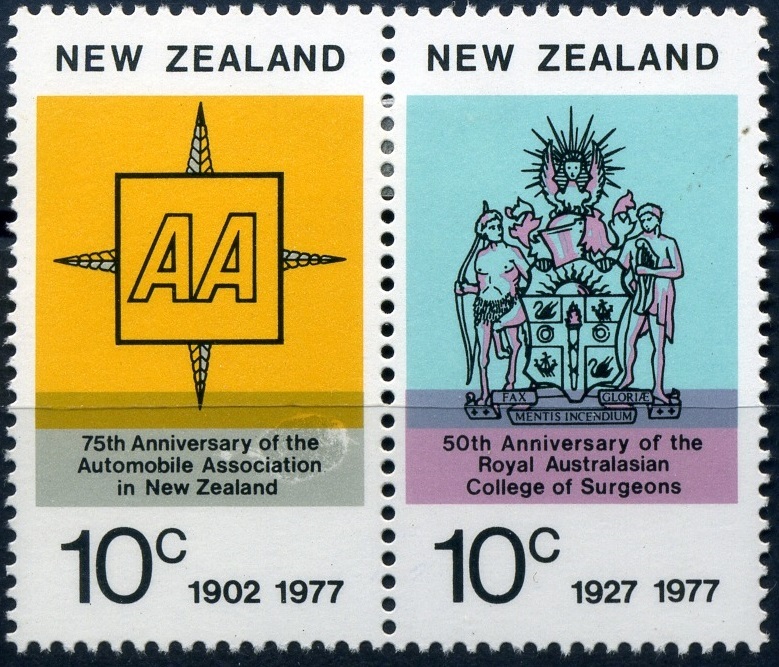 New Zealand has been actively involved since the first council of the College was elected in 1927 - one of the two Vice-Presidents then was Louis Barnett of New Zealand. 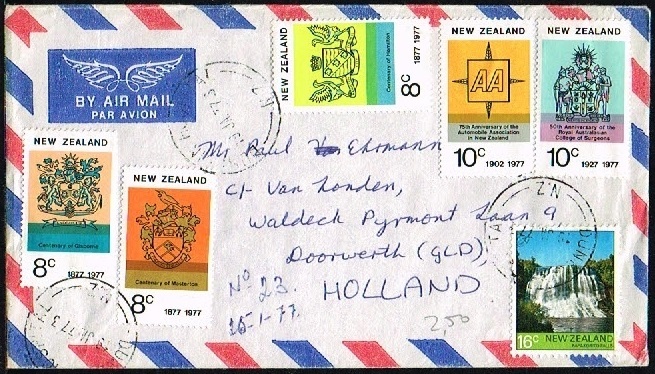 An Addressed First Day Cover showing both Se tenant strips. 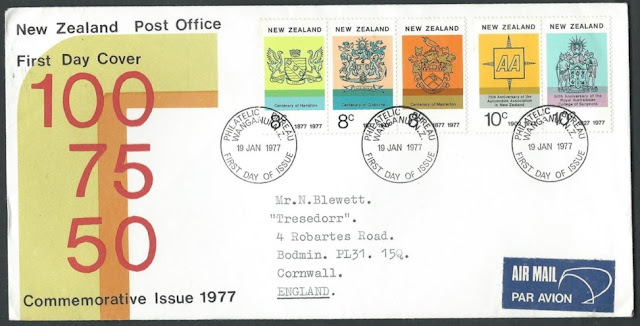 Two covers featuring the 1977 Anniversaries that were sent overseas. 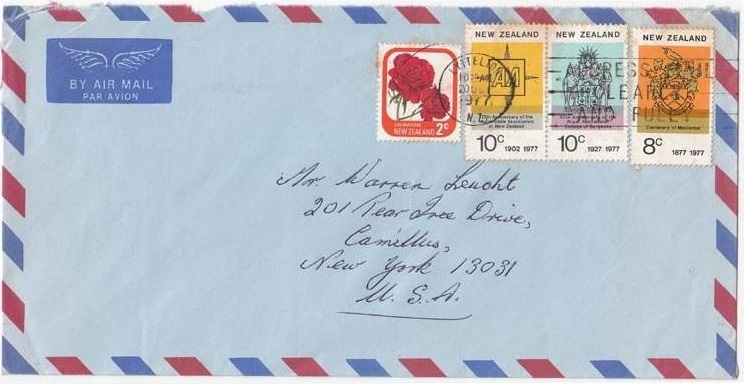 Neither was a First Day Cover. Three Errors in the Grey Colour. While the rest of this post features used stamps we only had mint examples of these errors. 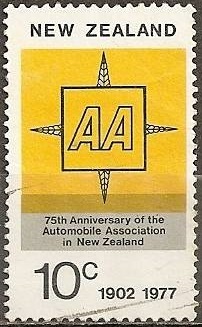 1977 10c AA stamp, a white flaw behind the letter i of Association. 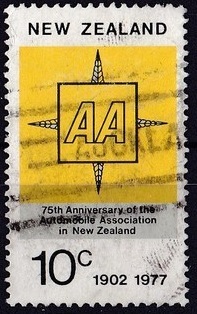 1977 10c Anniversary pair with major flaw on 10c AA stamp, a 8mm circular area where the grey has been affected by a major flaw. Information for this post came from. 1998 - 1999 Scenic Stamps. 2016 Queen Elizabeth 90th Birthday. 2013 Matariki - The Koru.